Opening hours at museums and archaeological sites around Greece will be extended as of Friday from 8 a.m. to 8 p.m. The Culture Ministry made the announcement on Thursday, having completed hiring procedures for seasonal staff before the summer period. The ministry announced that it signed eight-month contracts with seasonal workers, which means the extension of opening hours could last until mid-December. Archaeological sites, monuments and museums in Athens can begin operating extended summer opening times from Friday, while those in other parts of Greece can extend their hours from the end of next week. 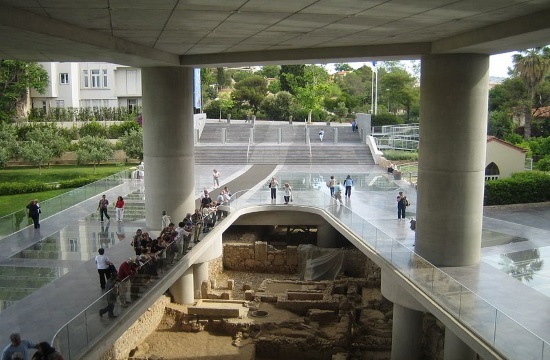 "The hiring procedures for summer seasonal staff for archaeological sites, monuments and museums in Athens have been concluded, following coordinated actions of the culture and sports ministry services. As a result, the extended opening hours for archaeological sites, monuments and museums can begin from Friday, April 12," the ministry said, pointing out that this was now the responsibility of antiquities ephorates and museums, ANA reports. The announcement said that the hiring of seasonal staff for most other areas of Greece is expected to be concluded by the end of next week, a fortnight earlier than the original deadline, covering 85 pct of the needs for additional site and museum guards, while this is to rise to 90 pct by Easter. It also pointed out that the contracts for seasonal staff will last eight months, rather than seven as in previous years, and that after consultation with the tourism ministry, the extended opening hours for sites and museums can continue until mid-December, in line with the longer tourism season attained in recent years.